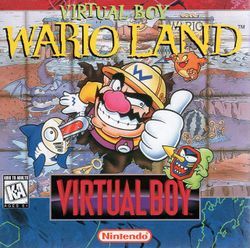 Virtual Boy Wario Land, known in Japan as Virtual Boy Wario Land: Awazon no Hihō (バーチャルボーイワリオランド アワゾンの秘宝, lit. "Virtual Boy Wario Land: Secret Treasure of the Awazon" and originally titled Wario's Treasure Hunt and Wario Cruise (as seen on its serial number), is a video game released by Nintendo for the Virtual Boy in 1995 and is the second installment in the Wario Land series, and the follow-up to Wario Land: Super Mario Land 3. The game begins with Wario landing his Bulldog airplane in the middle of the Awazon river basin for some relaxation time. The vacation comes to an end however when he spots three Mask-Guys heading behind the Aldegara Waterfall carrying treasure. In claiming the treasure for himself, Wario follows the trio into their secret cavern, but is soon surprised by a trap door which plunges him into the underground chasms below. Now caught in a deep underground labyrinth, Wario swears to seek out his revenge and claim the treasure from the Mask-Guys. Artwork from the instruction manual, showing Wario about to fall into the trapdoor placed in front of the treasure room. The artwork demonstrates how the player gradually climbs their way out of the underground chasm by unlocking elevators, found at the end of stages. Upon falling down the precipice within the earth, Wario must find his way through fourteen underground stages, including four boss stages, in order to make his way out. An elevator is found at the end of each stage, allowing Wario to climb higher the more he progresses in the game. A gate key is hidden somewhere in each stage, in which obtaining it is vital as it grants access to the elevator. Before each boss, a guard must be defeated before gaining access to the boss of that stage. The power and difficulty of the guard increases with each boss stage. Each of the ten stages contain a well-hidden treasure, with each one resembling a different real-life object (such as a pocket watch and fountain pen). Collecting all ten treasures will allow Wario to enter a treasure room at the end of the game. Wario's health system comes in three stages. He starts off in his ordinary form. Garlic bottles and Viking helmets are found throughout ? Blocks, which will transform Wario into Bull Wario. If Wario takes damage at any time by touching harmful enemies, spikes, lava, etc., he will be reduced to Small Wario. Collecting a garlic bottle as Small Wario will restore him to normal form. Taking damage as Small Wario will result in a loss of a life, sending Wario back to the beginning of the stage. Reaching zero on the twenty minute time limit will also cause Wario to lose a life. Wario begins with three lives. More can be earned by either collecting one hundred hearts or a diamond. If Wario loses all his lives, he receives Game Over and loses all hearts and coins. In a Game Over, one collected treasure will be lost (if any, and the deduction begin from the most recent stage and works backwards). Wario has three additional forms which can't be reached through the garlic bottle power-up. They are Eagle Wario, Sea Dragon Wario and King Dragon Wario. Eagle Wario is reached by collecting an Eagle Statue, which can be found in ? Blocks. A Dragon Crystal can either transform Wario into Sea Dragon or King Dragon form, depending on the circumstances. If a Dragon Crystal is collected in any form but Eagle, Wario will transform into Sea Dragon. However if Eagle form is present when a Dragon Crystal is collected, he will transform into King Dragon Wario. It can also work the other way, where if an Eagle Statue is collected while in Sea Dragon form, King Dragon form will be reached. The King Dragon form has both the abilities of Eagle and Sea Dragon Wario, being able to fly and attack with flames respectively. Many coins and hearts are scattered throughout the ten main stages. There are two types of coins; one with a rhombus on it and other with a crown. The more common rhombus coin is worth a single coin towards the score, and the rarer crown coin is worth twenty. All coins collected in a stage are put towards a grand total, which is counted up after entering the elevator in the room before the next stage. There are two types of hearts; one smaller and one significantly larger. The larger heart is worth ten small hearts. Coins and hearts can spent on playing mini-games between stages. Many different types of blocks are found in the game. "? Blocks" hold objects or items which can be collected or used by Wario. These can only be struck once. A more common type of block looks like a square stone which can either be broken or cracked. Normal Wario can crack blocks by hitting them from below. Hitting again will break them. Small Wario can only break already cracked blocks, while Bull Wario can break them in one hit, cracked or not. A much larger version of these blocks can only be broken by Bull Wario. Other methods of releasing an item or breaking a block can be performed through a Barge or Body Slam. Hidden Blocks can't be seen unless they are struck from below, which they will then release the object or item and become visible. Bonfire Blocks are the same size and shape as other blocks, but they have a flame symbol. These kinds of blocks can only be broken by the flames of Sea Dragon or King Dragon Wario. There are also areas of walls or flooring within stages which at first do not appear as breakable blocks. They are able to be broken using flames as aforementioned, and they usually lead to a hidden area. Jump Boards are able to sling Wario to the background of the stage and vice versa. This is used when there is a separate area which is in the background that contains collectibles. Similar objects appear in the eleventh stage, where many of the Pan Platforms can send Wario into the background. In this stage also contains electric fans placed throughout areas. These fans will periodically turn on and off, and while rotating can send Wario flying in the direction of the wind. Warp Pipes also appear in the game: entering one will send Wario to a different area. Seen in the sixth stage are two secret switches, each with half a Phanto-esque mask shown on the front. Hitting both secret switches will destroy a wall to reveal a jump board that Wario can use to a hidden area. Many different types of enemies are seen throughout the game, many being unique to a certain stage. Simply jumping on an enemy will not defeat it in most cases, it will usually temporarily stun them. Ground Pounding near an enemy may also stun it. When stunned, an enemy will become harmless and can be picked up and thrown. If a thrown enemy clashes with another enemy before bouncing twice, they will both be defeated. Usually, Wario would need to Barge, Ground Pound or Body Slam a weak spot of an individual enemy to defeat it. A stunned enemy can also be thrown into a coin cloud to redeem coins. An Angry Watermelon is seen blocking paths in Stage 9. Melons dropped by Honey-Bees can be placed on a Watermelon Spring, which will send it flying upwards into the background, possibly hitting the button which destroys the Angry Watermelon, thus clearing the way. The gameplay theme and terrain varies from stage to stage. Most of the terrain Wario will encounter is made up of solid flooring. Some stages are part or entirely made up of water, where Wario is able to swim in. Some areas contain water currents which are difficult to swim against. The sixth stage is the only one that contains a waterfall, which Wario is able to slowly climb. Shallow bodies of harmful lava are seen throughout the game. Stage 11 contains areas where the player must safely travel over flames along the ground, and sometimes on the ceiling. Conveyor belt flooring is seen in Stage 9, which will move Wario in a certain direction while he is not moving. Boss stages (marked with an asterisk below) are marked with a skull symbol on the map screen. Horned Toady Weak, harmless enemies which will ram Wario with their alien-like antennas. They can easily be defeated by a Body Slam or a Barge. Bomb-Bat Bat creatures who emerge from the background carrying a thorned bomb. As Wario walks by, they will drop this bomb and it will bounce in the direction of Wario. Upside-Downer A creature with a skull as a head. They are found walking upside down along the ceiling, and will fall onto Wario with their fangs if he passes underneath. Metal-Head Metal-Heads emerge from wooden doors when Wario approaches. They will then charge at Wario while pointing their spears. Mask-Guy One of the most common enemies seen in the game. They will charge Wario if they catch sight of him, using their sharp spear on their nose as a weapon. When bumped from behind, their mask will fall off, revealing their true form. Chain-Saw Fish A common underwater enemy that can swim at high speed. They use their chain-saw nose to harm Wario. Thorny Fish A slow-moving fish that swims between the background and foreground of a stage, often being followed closely by a school of fish. Flying Fowl Flying Fowls circle large tree trunks, and will at swoop with their sharp beaks if Wario is nearby. Chippy A bear-like enemy that can behave in one of three different ways. Most Chippies can be found walking along the ground, throwing explosives at Wario. Others hide in trees and throw spears, whereas some float down to the ground on a leaf, carrying a spiked shield. Dark Tortoise An enemy that throws shuriken-like objects, which can harm Wario. Waterfall Climber These creatures sit on rocks, and are able to jump up high and climb the stage's waterfall. Their horns are able to harm Wario. Thorn Rocket A spiky enemy that is found sitting on areas of quicksand. Thorn Rockets propel themselves upwards, making it more difficult for Wario to pass. Plant Chomper Stationary creatures that resemble Munchers from the Super Mario series. They can be found in large groups forming the ground, and can harm Wario with their teeth if he tries to walk across them. The shadows of Plant Chompers can also be seen within areas of quicksand. Torny Tornies are found moving over the top of Plant Chompers. Wario is able to sit on top of a Torny, in order to cross areas of Plant Chompers without being harmed. Big Blob A mini-boss that blocks the entrance to a door, and is invincible to all of Wario's attacks. Wario must lure a Torny into the Big Blob, which causes it to shrink and disappear. Mastah Mosquito A large mosquito that swoops at Wario whenever he approaches, aiming to harm him with its sharp proboscis. Mole Burrower A mole creature who is found within walls underground. It emerges when Wario approaches, swinging it's arms and harming Wario if he is to come into contact. Pollen Plant Pollen Plants are able to walk on their roots and open their flower to release spores, which harm Wario. Honey-Bee Honey-Bees occupy conveyor belt areas, dropping Watermelons and Bombs on Wario if he comes near. Angry Watermelon A large watermelon that either blocks Wario from accessing the next area, or hides a hidden door. Either Angry Watermelon may be defeated by correctly using the Watermelon Spring. Blade-Face A creature with two cleavers protuding from either side of its body. 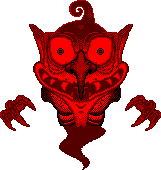 Blad-Face will levitate and circle an area, harming Wario if he touches the blades. Coo-Coo A featherless bird who resides within Coo-Coo Clocks. Coo-Coo will emerge from the clock and begin to rapidly lay eggs. These will hatch into Little Coos upon hitting the ground, and will quickly blow up. Little Coo A mechanical bird produced by Coo-Coo. They come from eggs which hatch as soon as they hit the ground. Little Coos will chase after Wario, quickly exploding. Flame Mask-Guy A creature resembling a regular Mask-Guy although they are covered in more spikes, and able to shoot flames from the nose of their mask. If Wario bumps off their mask, their revealed form is identical to a regular Mask-Guy. Face Ball A large ball creature which looks similar to a Phanto mask. This mini-boss produces Little Face Balls, and a harmful substance which gushes from its mouth. Wario must defeat a Face Ball in order to leave certain areas. Little Face Ball A smaller species of Face Ball which is produced in groups of three. They possess harmful spikes on their underside. Little Face Balls can be thrown at Face Ball to inflict damage. Vase A decorated vase with eyes. This creature is immobile if left alone, but if Wario is to pick up and throw them, the effect which follows depends on which side the vase lands on. Vase-Based Vase-Based is produced when a Vase is left on its side. This foe will slowly bounce around the room, aiming to harm Wario with its spears. Lightning Saucer This piece of machinery horizontally patrols the upper area of the screen, always moving directly above Wario. Once positioned, they will send a bolt of lightning towards the ground, harming Wario. Magma Saucer Magma Saucer can be seen as a counterpart to the Lightning Saucer. They patrol the upper area of the screen, releasing balls of magma when Wario is nearby. Fire Octopus These creatures reside in certain areas where the floor is made up of flames. When Wario is nearby, Fire Octopus will leap into the air, breaking any blocks in their way and aiming to land on Wario. They also cause the floor to shake every time they land. Thorn-Ball An enemy resembling a bee, which propels spiked balls high into the air. They appear in both the stage's foreground and background. Virtual Boy Dave Frear, Nintendo Life 9/10 "Big fans of the first game might lament Wario Land II's sudden significant change in gameplay, but if you give it a try, you'll find that it's actually quite good. All the unique new gameplay features help flesh the series out and turn it into a wildly different, yet still equally entertaining game, which should be checked out by both those who liked and disliked its predecessor." Virtual Boy Neal Ronaghan, Nintendo World Report 8/10 "ll in all, Virtual Boy Wario Land is a satisfying adventure that is fun even in its brevity. If you ever come across a Virtual Boy, it is a must play, as it is far and away the best game on the system. However, Wario’s long-lost second adventure isn’t quite good enough to be worth the hassle and expense of acquiring a Virtual Boy. If this Wario adventure ambles his way to Virtual Console in the future, it’s a worthy purchase, but just know you’re not getting a transformative experience; you’re just getting a decent Wario platformer with some cool 3D effects." Virtual Boy Nike Halifax, Nerd Bacon 8/10 "Overall, Wario Land is a great game, and I’m glad that it got to evolve as a franchise beyond the Virtual Boy. At the same time, it’s a shame that so few people have ever gotten to play it. It more than holds its own–it’s charming, it’s whacky, it’s addictive, it has the perfect balance of challenge and accessibility, and it’s a game that (if it were on a system where such a feat is actually possible) you can pick up and play any time. And you should play it. I’ve encountered many a Virtual Boy dissenter in my time, and all it takes is fifteen minutes of Wario Land to make even the most stubborn curmudgeon at least admit that it’s not so bad. “Not so bad” is a hell of a lot better than “awful.” Hey, I’ll take it." The staff team involved in the development of Virtual Boy Wario Land was smaller in comparison to other Wario Land games in the series. Hiroji Kiyotake co-directed the game, while Kazumi Totaka developed the music and sound effects. If the player waits at the end screen for 1 minute and 15 seconds after beating the game, Totaka's Song will play. For this subject's image gallery, see Gallery:Virtual Boy Wario Land. A sticker of Small Wario under the more recent name of Tiny Wario appears in Super Smash Bros. Brawl, which makes Virtual Boy Wario Land the only Wario Land game that is also mentioned by name outside of the Chronicle in Brawl. This is the last Wario game produced by Gunpei Yokoi before he left Nintendo in 1996 and died in 1997. This is the only Wario Land game not to be re-released on the Virtual Console in any form. This page was last edited on April 24, 2019, at 17:47.